From charging your phone to preserving your food, you depend on electricity for a lot. In fact, there probably aren’t many things in your home that don’t require electricity. That’s why losing power is such a big deal. Outages leave your home uncomfortable, dark and possibly even unsafe. At Rowell’s Services, we offer expert generator installation and repair services to make sure you never get left in the dark! Home generators provide vital electricity when the main power supply goes out. When you invest in a whole-home generator, you can rest assured knowing that you will have power even when your neighbors don’t. They come in a wide range of sizes, making it possible to power just a few outlets and important appliances or your entire home. 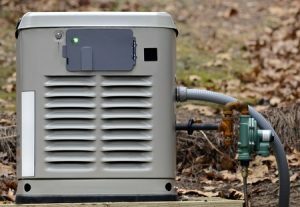 Most home generators have two main components: a motor that generators electricity and the control panel that connects to your home’s circuit breaker. The motor is installed outdoors in a weatherproof, sound-resistant box. The control panel is connected by a switch that automatically detects when the power goes out. When an outage is detected, the switch activates the motor and instantly starts feeding power into your home. At Rowell’s Services, our expert electrical technicians are here to help you choose the generator that is best suited to your needs and install it in a safe, professional manner. Like all electrical projects, installing a generator by yourself can be dangerous, and doing so could lead to problems with the system’s functionality. For generators in Northfield, New Hampshire, and the surrounding communities, trust the experts at Rowell’s Services. We hire only the best electricians and require them to complete rigorous training to make sure they’re the best in the business. To schedule an appointment, please contact us today by calling 603-934-4145.